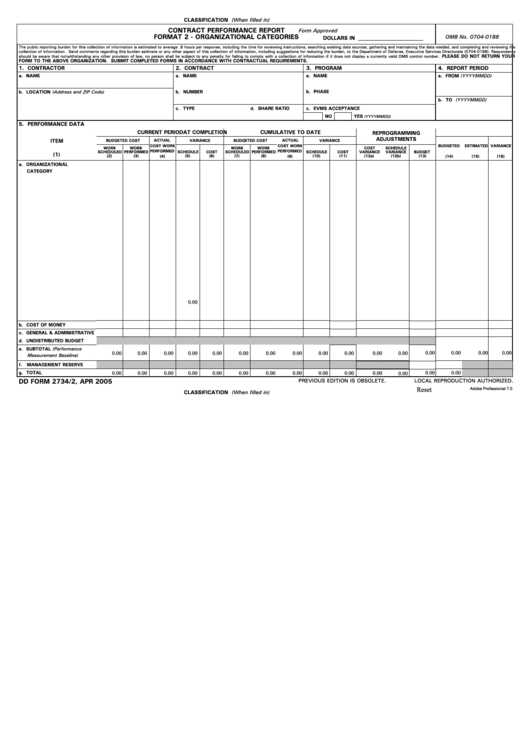 Download a blank fillable Dd Form 2734//2 - Contract Performance Report Format 2 - Organizational Categories in PDF format just by clicking the "DOWNLOAD PDF" button. Complete Dd Form 2734//2 - Contract Performance Report Format 2 - Organizational Categories with your personal data - all interactive fields are highlighted in places where you should type, access drop-down lists or select multiple-choice options. should be aware that notwithstanding any other provision of law, no person shall be subject to any penalty for failing to comply with a collection of information if it does not display a currently valid OMB control number. FORM TO THE ABOVE ORGANIZATION. SUBMIT COMPLETED FORMS IN ACCORDANCE WITH CONTRACTUAL REQUIREMENTS.